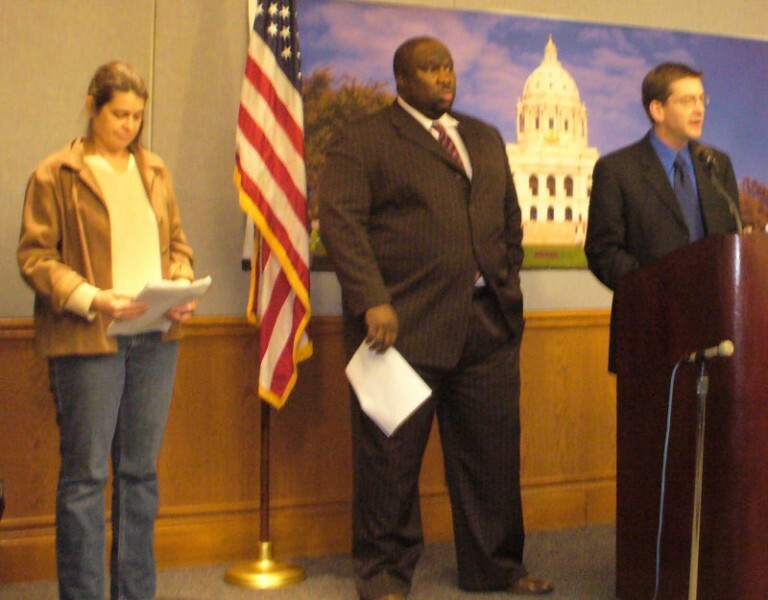 MN Foreclosure Moratorium at Senate and House Hearings | Fight Back! St. Paul, MN - The battle is under way to put a moratorium on home forecloses in Minnesota. The first legislative hearing on an bill to put a moratorium on foreclosures and evictions began with a joint hearing by State Senate Economic Development and Housing Budget Division and Health and Housing and Family Security Committee, Jan. 27 at the Minnesota state capitol. Before the hearing, there was a news conference featuring legislators who are sponsoring the legislation - state Senator Scott Dibble and state Representative Jeff Hayden - along with Deb Konechne of the Minnesota Coalition for a People's Bailout and Leslie Parks, a Minneapolis woman who is resisting foreclosure took place before the hearing. At the press conference, Konechne stated, "The legislation being sponsored by Senator Dibble and Representative Hayden and being heard this week is an initiative to protect working and low-income people from the worst effects of the foreclosure crisis as well as protect tenants in rental properties that go into foreclosure." Konechne continued, "Low-income and working people did not create this crisis and we should not be losing our homes due to the economic crisis of the rich and powerful. The federal government is providing hundreds of billions of dollars to banks and corporations. Minnesota must take action." The Minnesota Coalition for a People's Bailout, a group of community, labor and other organizations, has been working with a broad range of community organizations to win support for the legislation. The act would put in place protections for tenants in rental properties that are foreclosed. "Tenants should not be evicted from their homes just because the landlord loses the property. Because the Legislature prescribes the foreclosure and eviction processes in this state, it can revise those processes to protect tenants in their homes," said Peter Brown of Minnesota Tenants Union, who testified at the Jan. 27 senate hearing. Phyllis Walker, president of AFSCME Local 3800 at the University of Minnesota, also testified. "When working people are laid off and cannot pay their mortgage, they try to renegotiate their loan. But it doesn't work because banks and lending institutions do not negotiate in good faith. They simply go through the motions and then foreclose on the property. Why is that? Is it because the home owner who has been paying a note every month for the past ten years can’t be trusted to live up to the terms of a new agreement? Is it because the bank or financial institution will take such a huge loss they will have to close their doors. The answer to both is no." The National Alliance to End Homelessness, in a January 2009 report, estimated that 1.5 million additional people in the U.S. would become homeless over the next two years. This is over and above the number who would experience homelessness without the effects of the economic crisis. "With the unemployment rate staying high for some period of time, with the overall effects of the economic crisis, working and low income people and our communities need continued protection from losing our homes and stability," said the Bailout Coalition's Alan Dale. The Minnesota Coalition for People's Bailout is planning a demonstration for Feb. 4, the opening day of the legislature. The bill for a moratorium on foreclosures will be formally introduced that day.